We're thrilled to have Shannon Grogan here to share more about her debut novel FROM WHERE I WATCH YOU. Shannon, what scene was really hard for you to write and why, and is that the one of which you are most proud? Or is there another scene you particularly love? The scene that was most difficult to write was the scene at the root of the betrayal by Kara’s sister, Kellen, before she died. I wrote the story in alternating, active flashbacks that weave throughout the present day story, so I don’t want to give it away because it all leads up to that scene, which was very emotional for me to write. The scene I think I’m most proud of is where Kara finally realizes who her stalker is. I saved it for pretty much the last scene to write because I wanted it to have a big impact, a spine-tingly, goose-bumpy impact! I love suspenseful books and movies so I knew this would be one of the most challenging scenes to write. It was definitely the scene that had the most edits from my agent and editor. How long did you work on FROM WHERE I WATCH YOU? The idea for this story came to me at the beginning of 2010, while I was querying another (now in the drawer) novel. It took me about six months, I think, to finish the first draft, and then another two years to revise it. I signed with my agent in January of 2013, had the offer from Soho Teen in Fall of 2013. By the time the book is out it’ll have been a 5-year journey. The road was long! I first started in my road to publication when I graduated art school at age 20, with the intention of illustrating picture books. Art directors, back then, said I needed to move to New York to work as an illustrator. Uh, I live in Washington state. So I gave up, and I also realized, as I was doing very small freelance art jobs for tiny publishers, that I didn’t want to illustrate other writers’ stories. I wanted to do my own. Anyway, life happened and I went back to college, got married, became an elementary teacher, and had kids. Creative writing in college inspired me to try to write novels. I started about 4 different romance novels, and never got past page 20. When I finished all the Harry Potter books I was really inspired to write an MG novel. It started as MG and ended up as a YA after I read Twilight. I felt I had more to offer teens in my writing, plus I wanted romance and kissing in my books! That first novel had over 120 agent rejections over the course of a year and a half, during which time I started on FWIWY. By the way, about that picture book dream—still working on it. I am a full-time teacher so my writing time is very precious and small! I write at night after dinner and lesson planning is finished for my classroom. Sometimes I write at Starbucks or the library while my daughter is at ballet, or my son is at baseball practice. Saturday mornings are the only quiet times I get so I try to get up early while everyone sleeps and I write then. I have two desks but I use them to pile up all of my writing and teacher stuff, and I write at the dining room table with my Target vanilla pillar candle burning, or on the couch. And I usually drink tea while I write. 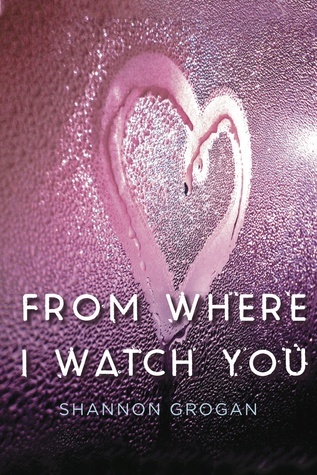 Have you had a chance to read FROM WHERE I WATCH YOU yet? Do you save certain scenes to write last similar to Shannon? Do you have a desk that gets used for everything but writing?